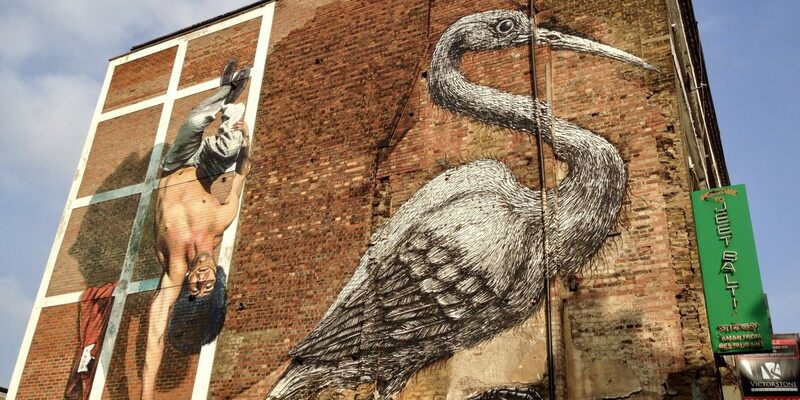 The vibrant street art in London showcases creativity from iconic artists like Banksy and talented up-and-comers. Wander through the city with an eye toward the street art to gain a new perspective. I’ve been fortunate enough to visit London many times, from short day trips on a layover to weekend getaways with friends. However, no matter how many times I go, there’s always something new to see. And one of my favorite ways to explore the city is by seeking out street art. Only 20 years ago, street art was better known as vandalism. London was one of the first major cities to embrace it; Banksy made his mark here, but he’s no longer alone. Now, street artists from around the world make their way to the walls of London’s various neighborhoods, creating colorful and vibrant works of art that are as compelling as they are ephemeral. Although most people equate street art with murals or painted pieces, you’ll probably see everything from stencils to paste ups to sculptures, stickers and statues. By visiting these different areas, you’ll discover a wide range of both artists and styles. 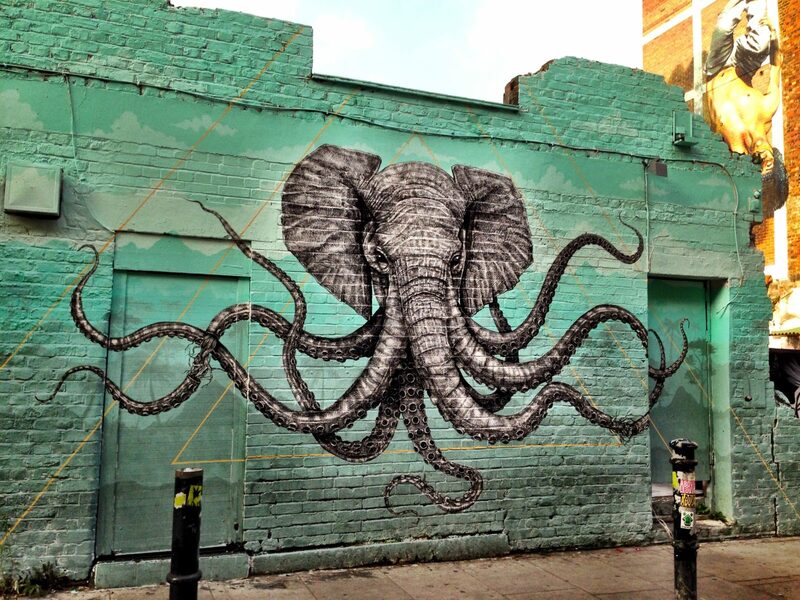 Several neighborhoods in London are treasure troves of street art. While each has a unique flair, you’re bound to find expansive murals and hidden gems no matter which one you explore. With the 2012 Olympics, East London enjoyed newfound popularity, and the street art continues to attract visitors and locals alike. 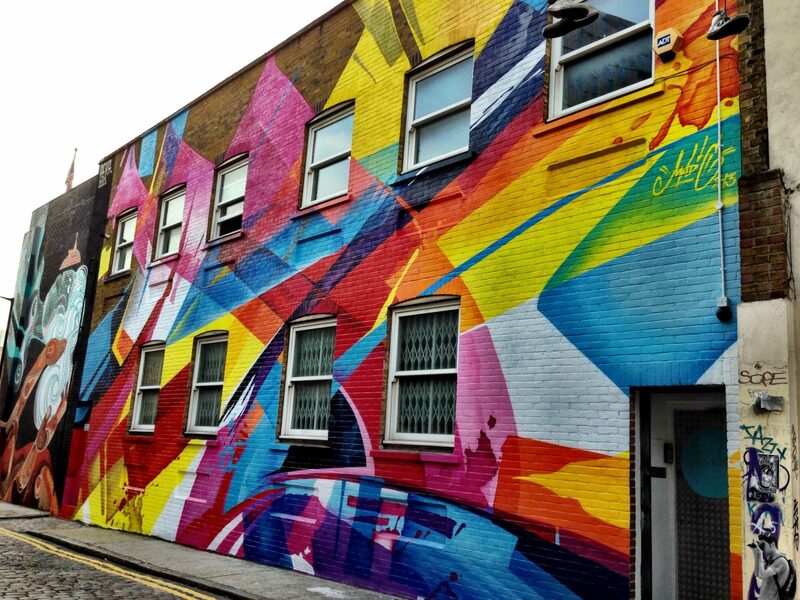 Shoreditch is perhaps one of my favorite areas to wander; you’ll find plenty of colorful pieces on Brick Lane. The neighborhood is also home to several massive murals and even monster sculptures hidden on rooftops. If you work up an appetite as you hunt for art, stop by one of Shoreditch’s funky restaurants, popup shops or bars. 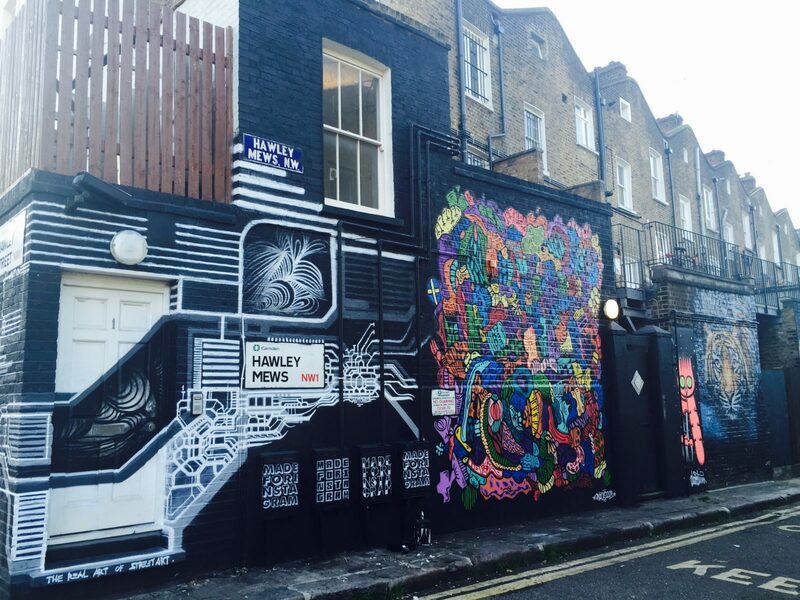 Camden Town, home to the famous Camden Market, is another great neighborhood for street art. I recommend picking up some tasty food from the Market to fuel you as you wander the area in search of building-side masterpieces. Finally, make your way over to Leake Street Tunnel near Waterloo; it’s another hidden gem, with every inch covered with colorful art. It’s easy to search out street art on your own, but to learn more about the art form and the artists, take a street art walking tour. Once you start wandering London, you may begin to recognize certain artists’ styles. Stik is possibly one of the most recognizable street artists in London. In fact, you can see his giant “Mother and Child” piece when you land at Heathrow — it’s said to have been the most expansive street art in London when it was created. ROA is another identifiable artist: you’ll find his black and white animals unfurling across the city, including in Brick Lane. One of the more popular artists in Camden Town is simply known as “Bambi.” She creates pieces inspired by modern society and features celebrities like Amy Winehouse and icons such as Nelson Mandela. Like Banksy, her real identity is unknown. Street art constantly changes: a piece that appears one day may be covered up by another artist the next day. Each walk is different and that’s what I love about it — it’s like a treasure hunt. I feel lucky to find each piece, knowing that it may be gone the next time I wander by. And it’s a great excuse to come back to London again and again. If you want to see street artists in action, visit during the annual Brockley Street Art Festival or the Moniker Art Fair.